If you’re looking for a low-impact fat-burning workout that will sculpt your muscles and tighten your core, PiYo is it. PiYo combines the best of Pilates and yoga, and Super Trainer Chalene Johnson teaches you how to work every single muscle to stabilize, stretch, and strengthen your body. But to get these results, you need to do more than just Push Play — you need to have a solid nutrition plan. 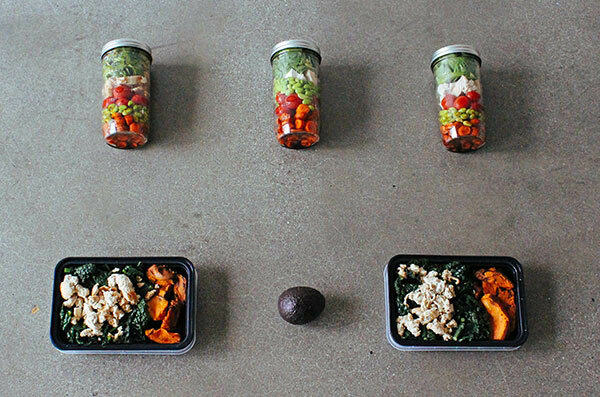 Aimed to make healthy eating easy and intuitive, the PiYo Get Lean Eating Plan breaks food down into five groups: primary vegetables, secondary vegetables/grains, fruit, protein, and healthy fats. You get a specific number of servings of each food group per day that’s dependent on your weight and goals. 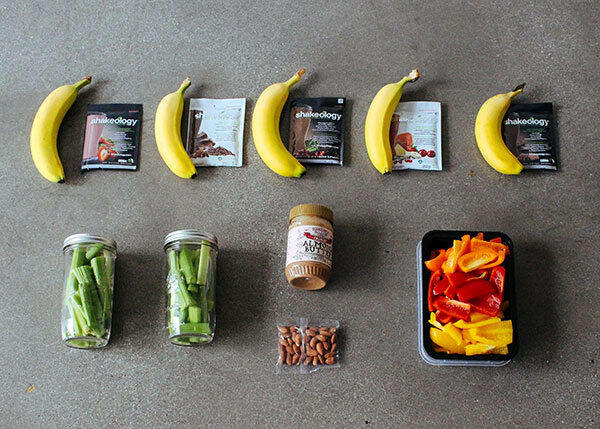 We put together this 1,800–2,100 calorie-level meal prep to make things even easier. At this level, you’ll get six servings of primary vegetables, three servings of secondary vegetables/grains, three servings of fruit, seven servings of protein, and four servings of healthy fats. And it isn’t full of boring meals either. 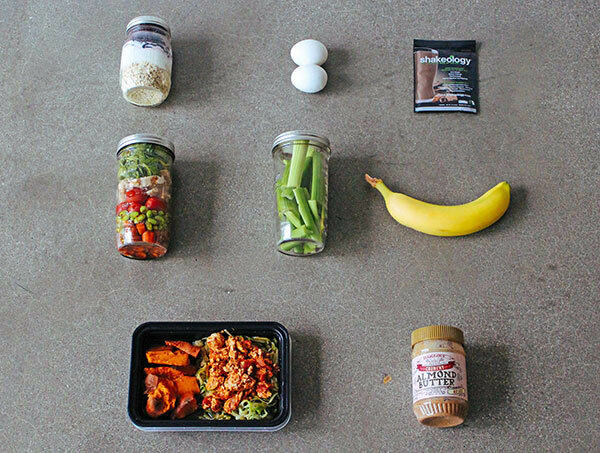 This PiYo meal prep includes recipes for overnight oatmeal, Turkey Marinara, baked chicken with roasted vegetables, and more. 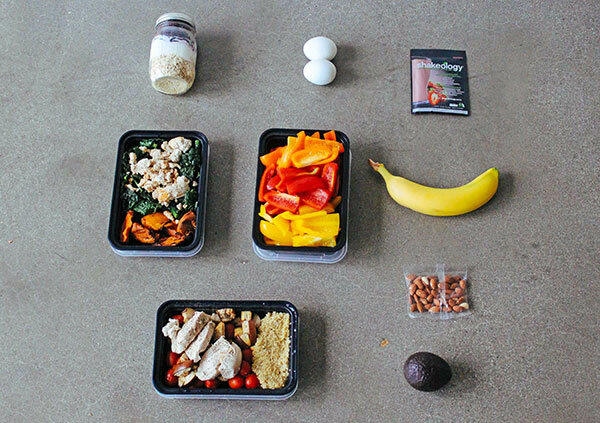 Scroll down for the meal prep, a grocery list, and a step-by-step preparation guide! 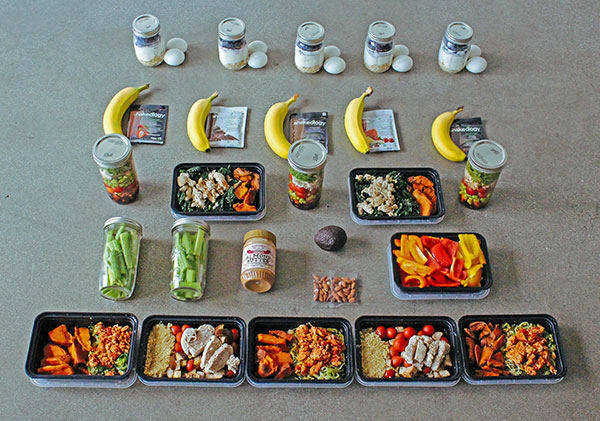 Pro tip: This meal-prep plan is geared toward PiYo, but it works well with many other Beachbody On Demand programs, too! 1. Start by baking the sweet potatoes. Preheat oven to 450° F. Wash and scrub 2½ pounds of sweet potatoes. Pierce each sweet potato several times with a fork and place them on the center rack in your oven. Bake for 35–45 minutes, or until tender when pierced. Remove from oven and set aside to cool. 2. Next, bake chicken breasts. On a second baking sheet or dish, arrange 2½ pounds of boneless, skinless chicken breasts. Season with any herbs or spices. Place baking dish in the oven for 15–20 minutes, or until chicken is no longer pink in the middle and juices run clear. Let cool for 20 minutes, then place in refrigerator. 3. Place 10 eggs in saucepan and add enough water to cover the eggs by one inch. Bring water just to a boil over high heat. Remove from heat, cover, and let stand for 12 minutes. While eggs cook, prepare a large bowl of ice water. Carefully remove the eggs from the hot water with a slotted spoon and transfer to the ice water. Place in refrigerator. 4. To make the Turkey Marinara, add 2½ pounds ground lean turkey to a medium pan over medium heat. Cook, stirring frequently, until turkey is no longer pink, about 6 minutes. Add one 25-oz. jar tomato sauce, no salt added, and stir. Remove from heat. Use a spiralizer or follow these instructions to make noodles out of 3 pounds of zucchinis: Using a vegetable peeler, cut each zucchini into lengthwise strips about ⅛-inch thick. Turn each zucchini slightly after cutting each strip to work evenly around the outside, stopping when you hit the seeds at the core. Discard cores. Cut slices lengthwise into ½-inch ribbons. Either steam the zucchini noodles in a steamer basket or gently sautée them in a nonstick pan coated with cooking spray for 2–3 minutes. Divide zucchini noodles evenly between three food containers. Top each with one with the fully cooked turkey mixed with tomato sauce, top with 3 Tbsp. of Parmesan, and add a side of ½ cup sweet potatoes. 5. A rice cooker will make quick work of cooking the quinoa, and will shut off automatically when it’s done. If you do not have a rice cooker, it can be cooked on a stovetop. Cook ½ cup quinoa in 1 cup water and then set aside to cool. 6. Make the roasted tomatoes and eggplant. Preheat oven to 375° F. In a nonstick pan, add 3 tsp. of olive, 2 cups of plum tomatoes, and 2 eggplants chopped into cubes, spread evenly. Put the pan into the oven for about 20 minutes until roasted. 7. Steam the kale by using a steamer, or follow these instructions: Put about one inch of water into a large pot and bring to a boil. Wash 4 cups of kale and put it into a metal colander. Place the colander in the pot with the boiling water for about 8 minutes until wilted. 8. Prepare the chicken dinners. Set out two containers. To each, add 6 oz. 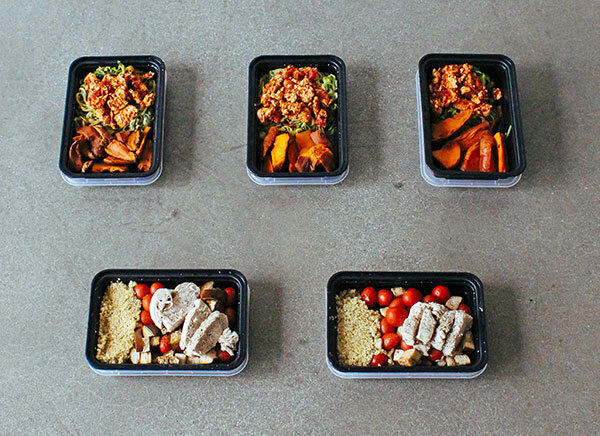 of the baked boneless, skinless chicken breast and top with 1 cup roasted tomatoes, 1 cup eggplant, and ½ cup quinoa. 9. Prepare the turkey lunches. Set out three containers. To each, add 6 oz. ground turkey, 2 cups steamed kale, ½ cup sweet potato, and 3 Tbsp. avocado. 10. Make the salad dressing. Place 4½ tsp. olive oil and balsamic vinegar to taste in small bowl and mix well. Set aside. 11. Next build the Salad Jars. Set out three large mason jars (or food storage containers). Add 2 Tbsp. dressing to the bottom of the jar (if you’re not using jars, reserve the dressing until just before serving). To each jar add 6 oz. chicken breast, 1 cup spinach, ½ cup tomatoes, ½ cup carrots, ½ cup edamame. Cover and place in refrigerator. 12. Last, prepare the oatmeal jars. 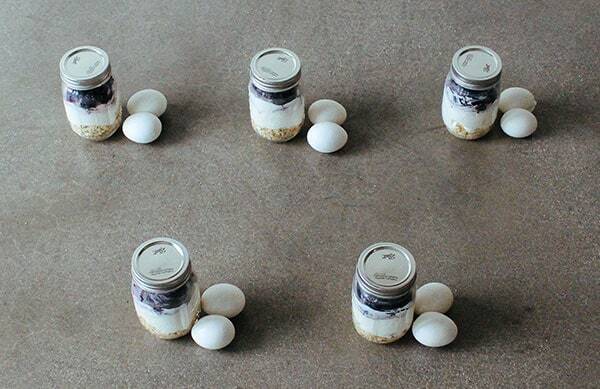 Set out five pint-sized mason jars. To each, add ¼ cup oats, ¾ cup Greek yogurt, and 1 cup berries. Cover and place in refrigerator. The oats will absorb the yogurt and will become soft enough to eat. Serve cold.